Is Red Wine Good for Your Blood? Although drinking alcohol in large quantities can increase your risk of health problems such as liver damage and addiction, having small amounts may actually be good for your health in some cases. 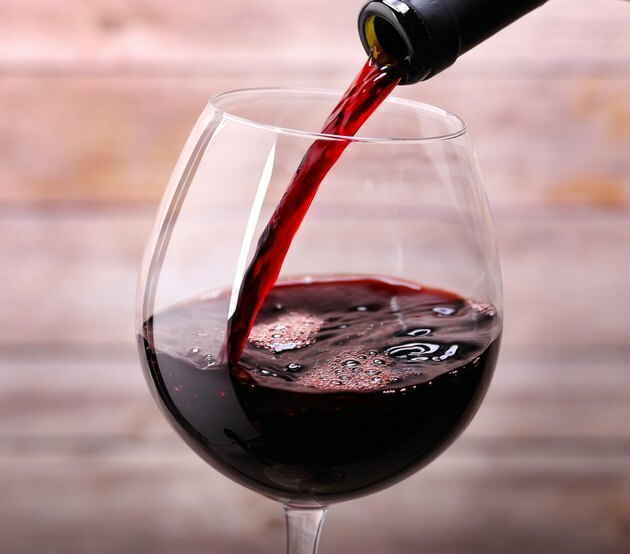 Red wine, a fermented drink produced from purple or red grapes, has long been thought to improve blood flow to your heart and reduce your risk of heart disease, according to "Circulation," an American Heart Association journal. Red wine is thought to have properties that prevent blood platelets from sticking together, which reduces your risk of blood clots that cause strokes and heart attacks, according to MayoClinic.com. One potential contributor is resveratrol, an antioxidant that is found mostly in the skin of red grapes. Resveratrol may also help reduce inflammation and lower "bad" cholesterol numbers in the blood, which can help prevent artery damage that reduces flow of blood and oxygen to major organs. However, some evidence suggests that alcohol in general -- nothing specific to red wine -- may be the major factor that reduces your risk of heart disease. Drinking a small amount of red wine or alcohol every day may offer slight benefits to your blood vessels and heart, according to a study published February 2008 in the "American Journal of Physiology – Heart and Circulatory Physiology." Researchers in the study found that people who drank red wine reaped virtually identical benefits as those who drank another form of alcohol. After a single drink, study participants were more likely to have dilated or "relaxed" blood vessels, which gives the heart less work to do. However, after two drinks, the benefits were counteracted: Heart rates of the participants decreased while blood volume increased, and the ability of their blood vessels to expand due to the increase in blood flow went down. Evidence in favor of red wine isn't strong enough to encourage people who don't drink to begin drinking red wine to reduce their risk of heart attacks and strokes, according to "Circulation." Drinking too much alcohol can be lead to a weak heart muscle, high blood pressure and electrical heartbeat disturbances. Be especially prudent in avoiding alcohol if you have a family history of liver disease or alcohol abuse. If you already drink red wine regularly, avoid drinking more than about one 5 oz. glass a day if you're a woman or two per day if you're a man. Ask your doctor for specific recommendations. If the resveratrol in red wine is responsible for heart and blood benefits, simply having grape juice or eating grapes would also offer you the resveratrol without the added alcohol, according to MayoClinic.com. Other foods that have some resveratrol in them are blueberries and peanuts. However, the effects of grapes, grape juice and other foods with resveratrol aren't well established. And although resveratrol supplements are available, they aren't likely to offer the same health benefits as red wine because the body can't absorb much supplemental resveratrol. How Much Red Wine Do You Need to Drink for Health Benefits? What Are the Benefits of Red Wine for High Blood Pressure? Can Drinking Wine Lead to High Cholesterol?